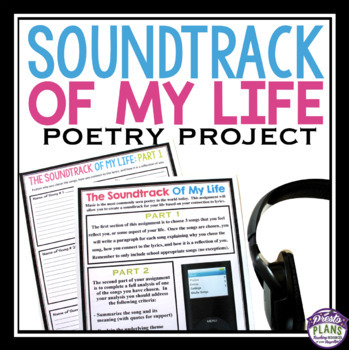 POETRY FINAL ASSIGNMENT: LYRICS MUSIC ANALYSIS: End your poetry unit with The Soundtrack Of My Life Assignment that allows your students to use something they love (music lyrics) to demonstrate their understanding of poetry. This Resource Is Included In 2 Bundles In My Store. Click Below! POETRY RESOURCE BUNDLE - 300+ Pages! MUSICAL POETRY RESOURCE BUNDLE - 70+ Pages! • Student instructions for the project which has students choose three songs that represent them. 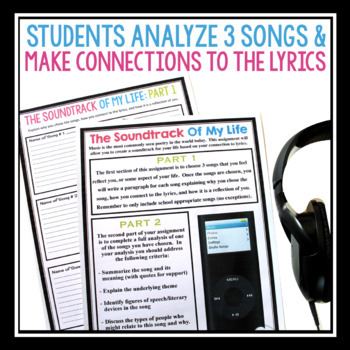 • An assignment sheet that asks students to make text-self connections for each song. • Worksheet with analysis prompting questions for each song (3 worksheets in total). ♥ My 7/8 class really enjoyed this. Great way to wrap up my lyrics interpretation unit. Thanks! ♥ My students loved this project!! ♥ Fabulous activity for my 7th & 8th grade ELA students! I will use this activity as a final project within our poetry unit after we analyze song lyrics.